Yes, I am still wrapping up my own posts for last month's reading challenges. Better late than never, right? 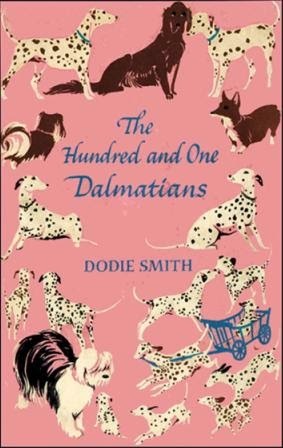 I had read 101 Dalmatians all by myself back in 2009 and had planned on reading it to the kids at some point in time. I was delighted when Amy picked this title for our July classic book club read because it provided me with the awesome opportunity to finally getting around to doing so. In short: the kids and I LOVED this read! Thoroughly! I won't rehash what the story is about because I imagine that there are very few people out there who are unfamiliar with it, thanks to Disney. I will say that thanks to my fabulous memory, I had mostly forgotten the way the story read. Therefore I was just as amused and delighted by the book as the kids were. I reveled in Smith's way of setting the scene and, particularly, describing the personality of the puppies. She had the bookworms and I chuckling over the behavior of the little pups. (My favorite part is when Lucky is warning the other puppies not to bite Cruella because she tastes hot! I couldn't help but giggle.) It was just an enjoyable read from beginning to end. The vocabulary is at a level that younger readers can track with the storyline and yet the prose is beautiful and thoughtful, making it equally enjoyable for the adult. 101 Dalmatians is a perfect combination for a fun family read aloud! If you didn't happen to read it with us this month, make time for it. Seriously. I can hardly think you will regret it. Following up on the concerns that Amy raised about Cruella, I did ask my kids as we went along if Cruella was too scary for them. They all assured me that they were not at all scared or bothered by her character. Truthfully, I think she made the story exciting to them. Our usual habit is to read two chapters aloud from a book each day. However, in the case of 101 Dalmatians , Bookworm1 would frequently bring the book back to me later in the day and ask for another chapter to be read. Bookworm2 would second the request and so we moved along at something of a rapid pace simply because we were having fun with it! Of course, after reading the book, we watched the cartoon classic of the same. The boys had seen the movie but I don't think my daughter (age 3) had. She thought Cruella-of-the-movie was scary and would close her eyes when Cruella occupied the screen. So perhaps we'll tuck that movie away for a few more years but I'm not sorry at all that we read the book this year. It was time well spent! This particular houseguest was a surprise (& a good one! ), so I didn't really think through our plans. However, I know her parents pretty well and know they would've raised no objections to anything I chose to read. However, I still didn't feel comfortable reading those particular details to her, and our own sensitivities here really confirmed that. Oh I was NOT saying that what you did want weird or wrong. (I can see how it might have been taken like that because it is worded poorly, but I hope you understood!) I've just never been presented with that situation and I think it's an interesting question to think about. What would I do? I don't know. Sounds like a fun read! Maybe I'll get to it some day. And didn't you just love the way Pongo and Missis opened their hearts to the puppies? This adoptive-mama-heart really identified with the way they were suddenly the mother/father of the pups.